2018 Hyundai Santro has amassed over 40,000 bookings with buyers showing more preference to AMT models. Sales nos are credit to Auto Punditz. 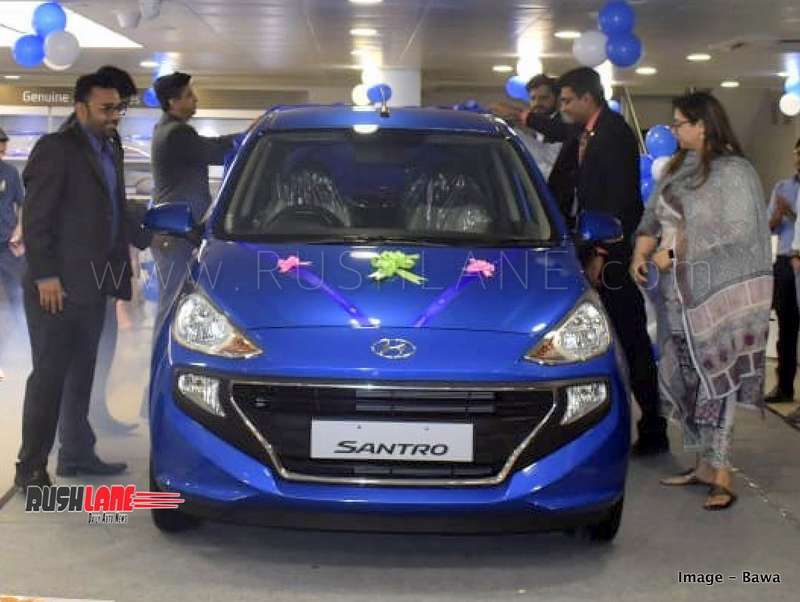 The new Hyundai Santro, launched in India on 23rd October 2018, has been noting outstanding demand. The company has already reported a waiting period upto 80 days depending on colours and variants while production operations have been ramped up so as to bring down waiting period. 2018 Hyundai Santro hatchback is priced from Rs. 4.24 to 6.14 lakhs. It boasts of a tallboy image and is built on a new platform. It comes in with new design, styling and best in class features along with better safety equipment. The new Hyundai Santro is slotted between the Eon and the Grand i10 and takes on the Maruti Suzuki Celerio, Tata Tiago and Renault Kwid in terms of competition. Speaking about sales, Hyundai Santro has managed to overtake rivals Tata Tiago, Maruti Celerio and Renault Kwid. For Nov 2018, sales of Hyundai Santro stood at 9009 units, that of Tiago stood at 7879 units, Celerio at 8371 units and Kwid at 5419 units. Maruti WagonR continues to lead the segment with 11,311 units sold. November 2018 was the first full month of sales for Santro. And in its first month, it has not only managed to beat rivals, it has also entered the top 10 car sales list for the month – taking the 10th spot. 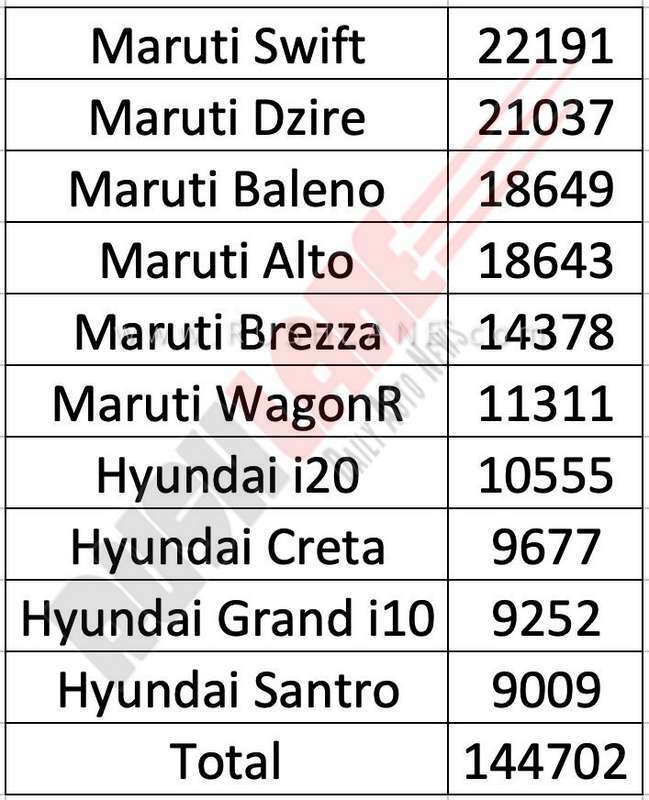 Below are the top 10 cars sold in India for Nov 2018. Tata will launch a new Tiago variant this month to push sales further. Speaking about the new Hyundai Santro, it is available in five variants of D-Lite, Era, Magna, Sportz and top of the line Asta is seen in color options of bright blue, red, green, white, grey and gold. It does not get any alloy wheels or LED DRLs but sits on 14” wheels as standard with silver wheelcaps. In dimensions, the 2018 Hyundai Santro is larger than its earlier counterpart, now measuring 3,610mm in length, 1,645mm in width and 1,560mm in height. It gets a 2,400mm long wheelbase offering best in class cabin space. It is offered in a range of five variants of for petrol manual version and two variants each for the petrol automatic and CNG manual variants. The new Santro gets its power via a 1.1 liter, 4 cylinder, naturally aspirated engine offering 69 bhp power and 99 Nm torque. This engine is mated to a 5 speed manual or 5 speed AMT gearbox, which has been developed in-house by Hyundai. Fuel efficiency stands at 20.3 kmpl. The engine also gets an 8 kg CNG tank mounted on the boot of the Santro which will offer 30.48 km/kg fuel efficiency.